The Rohingya refugees are “the world’s largest stateless population”, said Ursula Mueller, the UN's assistant secretary general for humanitarian affairs, as she called on the international community to help their plight. Speaking at a high-level event on the issue of Rohingya at the UN on Friday, Ms Mueller said the Myanmar government “must take real steps forward, clearly demonstrating a commitment to immediate change on the ground”. Bangladesh has played host to the largest refugee camp in the world, last year more than 725,000 Rohingya fled to the country from neighbouring Myanmar following the outbreak of violence in August 2017. She said the world is witnessing “newest chapter of what has been a long and tragic history for the Rohingya people”. “As humanitarians, and as members of a global humanity, we cannot turn away from the reality that the Rohingya people have been subjected to extreme, unthinkable violence in the context of decades of discrimination and persecution,” she added. Ms Mueller, who visited Myanmar in April, was able to witness first hand the plight of the Rohingya and looked to relay her experience meeting the affected communities, humanitarian rights activists and political leaders to the world stage. “The men, women and children I visited in communities across Rakhine were clearly deeply affected, scarred by a history of conflict, many trapped by authorities in squalid camps and all scared and uncertain about their future,” said Ms Mueller. She added that the concerns are present on both sides of the Myanmar-Bangladesh border, with more than 600,000 Rohingya still in Rakhine State. She said they still face “discrimination, marginalisation and hardship”. Ms Mueller said that the Myanmar government has placed ongoing restrictions on freedom of movement and limited access to services, like healthcare and education. “Most remain in dire need of humanitarian assistance. We cannot leave them behind,” she said. In northern Rakhine, the UN and other humanitarian aid partners still have very limited access to more than 200,000 stateless, despite some small steps being made to provide aid. In central Rakhine,128,000 remain in “deplorable conditions in camps” more than six years after the 2012 outbreak of violence. She added that the conditions in Rakhine are not yet able to provide the voluntary repatriation of Rohingya refugees from Bangladesh, and said that it is the responsibility of the Myanmar government to provide that. “In Bangladesh our focus must remain clearly on both of the inter-related challenges before us. 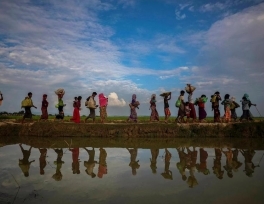 In Bangladesh we must support and adequately fund a humanitarian response to a refugee crisis of enormous size and scope – currently this response is only 38 per cent funded," Ms Mueller said. Meanwhile, Amal Clooney, who is part of the legal team representing the two Reuters journalists imprisoned in Myanmar, called on the country's de facto leader Aung San Suu Kyi to address these violations. At a briefing in the UN, she brought the families of the reporters, who remain in prison and said Ms Suu Kyi’s legacy would depend on how she addresses these issues. 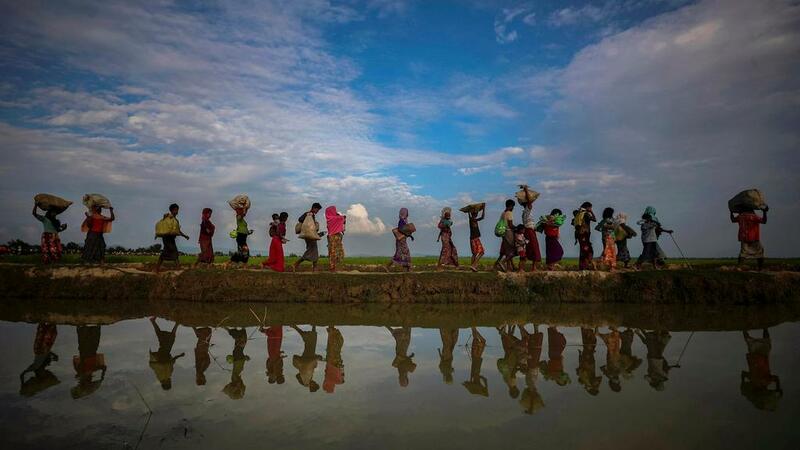 The Rohingya and the OIC: A voice against the ethnic cleansing?